The Town that would have a Pageant is set in ‘Mangel-Wurzelton’ – a small provincial town – with the action passing from a Committee Room in the Town hall through to the local theatre – some weeks later! ‘Walthamstow’s Mark House Secondary School Stagecraft Club last weekend presented ‘The Town That Would Have a Pageant,’ a lively comedy by L Du Garde Peach. Thirty members took part : 29 pupils and one master, Mr J Bowling, who played ‘The Earl of Bliss’. An audience of about 80 consisted mainly of parents, friends and teachers at the first show. 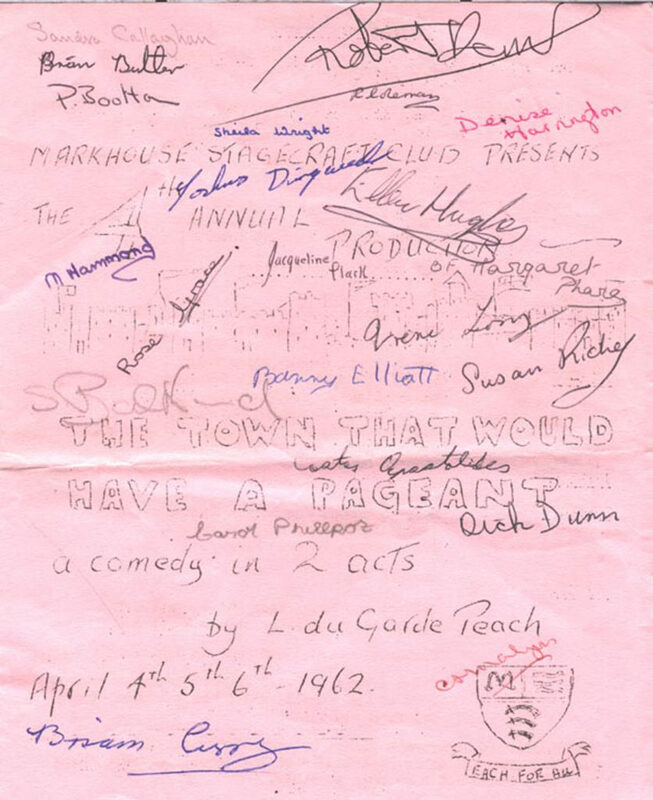 There were plenty of laughs in the play, the plot of which revolved around the preparation and presenting of a pageant, held in the topsy turvey town of Mangle – Wurzleton. The comedy is strengthened by the assumed deafness of Councillor Joe Pool (Michael Brennan) who only hears ‘what he wants to hear’. Then there is Dr Holden (Brian Butler) for ever on the alert for a call from an expectant mother. Eventually he is called away and the scene ends with the news that the lady had twins. There is Eleanor, Countess of Bliss (Margaret Phare) always late, airily off the point and forever charming, though a little tiresome at times. Outstanding in the first scene is the Mayor (Barry Elliott) who, with his round honest face, little black moustache and benign gruffness, is a star turn in himself. The second scene depicted and exceedingly funny interpretation of a stage rehearsal for the show, the actors purposely forgetting their lines and stumbling over the half made props. Finally there was the presentation of the great pageant itself. The Mayor formally opened it and sat with the Mayoress in two reserved seats at the front. There were some clever sequences in the pageant and the scenery throughout was magnificently painted, from the panelled council chamber in the first scene to the pageant stage sets in the final act, by art master John Jones. The moveable scenery was made by the boys in the school stagecraft workshop and art room; while the costumes were made within the school by parents, teachers and girls under the supervision of Miss E Beakon. Pianist was Richard Dunn and the stage-management was in the hands of Miss J Malyon. I had the pleasure of attending the final performance on Friday last, and it is many years since my wife and I have enjoyed so much laughter – at times we were convulsed and I am sure that this goes for the remainder of the audience. Great credit is due to all who took part in producing this comedy, and to the actual performers I would give special praise. I, in common with many others, do not always think very highly of the younger generation of today, but I have to revise my opinion now. These boys and girls were really first class and how they all remembered their lines and parts is amazing. I do not want to single out any particular actors – but I cannot pass over the performances of the ‘Mayor’ and ‘Town Clerk. These characters were perfect and there is evidence of great talent here. There is not enough publicity given to efforts of this nature and the standard of this show was far higher than most of the drivel shown on television. In fact, it should have been on television. 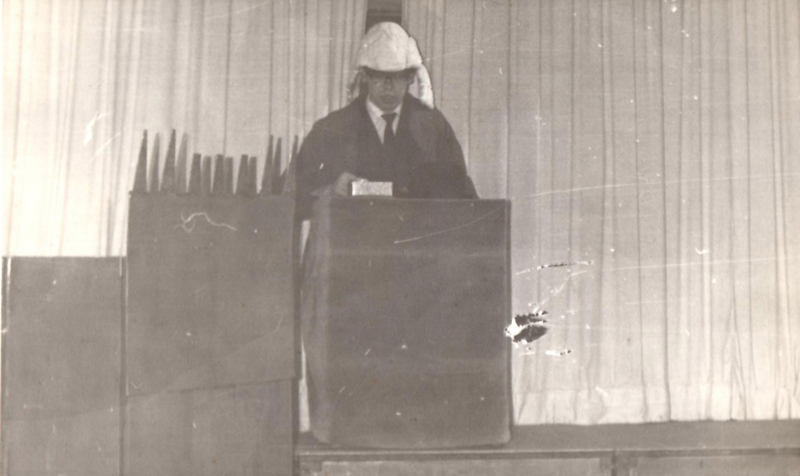 To the Headmaster and his Staff I would like to say that you are doing a wonderful job – thank you: and to the boys and girls who took part – thank you for teaching us how to laugh again, it was a most enjoyable time and a jolly good show. “Stage extension built from recovered timber by boys of the school under the guidance of Mr P Hayden. The Stagecraft Group wishes to acknowledge all the help received from the other Departments of the School, without which this play would not have been possible”.